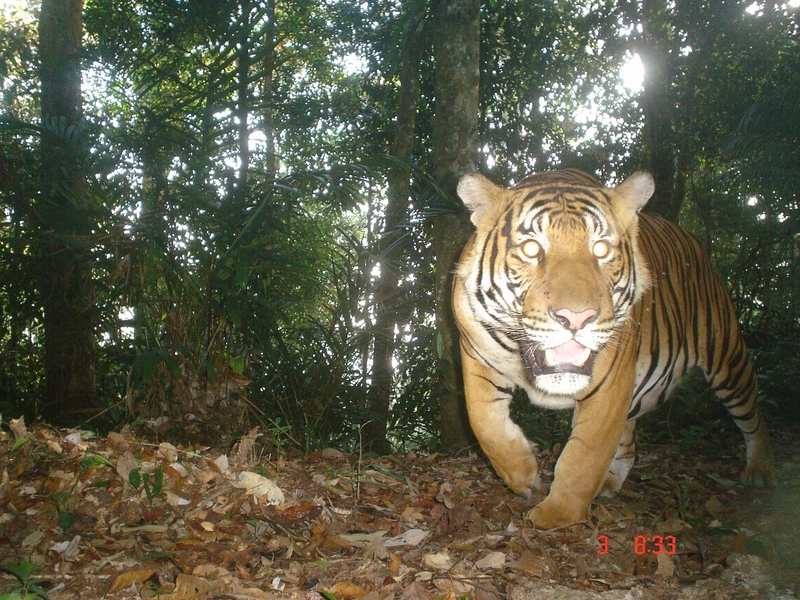 Wild Malayan tiger (Panthera tigris jacksoni) caught on camera. 2017 marks the 45th year that WWF-Malaysia has been championing conservation of wildlife in our forests, oceans and freshwater ecosystems. The organisation would like to take this opportunity to highlight the conservation status of its flagship species – the Malayan tiger, marine turtles, the orangutan and elephants - as we observe the UN World Wildlife Day on 3 March. Petaling Jaya: “Wildlife species are losing their habitats globally at an alarming rate. The desire of humanity for economic growth and development is on an unsustainable path, as more and more of the planet’s finite resources are extracted and consumed on a yearly basis. There is an urgent need to halt the degradation of the planet. The habitats that wild animals live in are the very same ecosystems that provide humanity with food, water, oxygen, climate regulation services and carbon capture functions. In short, we need to sustain these ecosystems and their services for the long-term survival of the human race,” said Dato' Dr Dionysius S.K. Sharma, Executive Director / Chief Executive Officer, WWF-Malaysia. “All parties, including businesses, governments, institutes, and the public, should work collectively to save Planet Earth. There isn’t another Earth out there; this is the only one we have,” he added. The tiger is an umbrella species and an apex predator. Since healthy tiger populations require a huge amount of forested areas, protecting tigers and their habitat will result in the protection of the entire ecosystem with services that humans rely upon. Within the last century, however, global tiger numbers have plummeted from 100,000 to only 3,900. This decline has been mainly driven by poaching (for their body parts), and habitat loss due to man's insatiable appetite for development. The loss of several Malayan tigers last year has sparked a growing awareness amongst Malaysians on the importance of our tigers and their vulnerability in the wild. Back in the 1950s, Malaysia was thought to have as many as 3,000 tigers. In 2014, the number of Malayan tigers was reported to have declined to an estimated 250 to 340, down from our previous best guess of 500 tigers back in 2003. It is now a 'Critically Endangered' species under the International Union for Conservation of Nature (IUCN) Red List, meaning that it faces a very high risk of extinction in the wild. The Malayan tiger has been pushed to the brink of extinction by poaching, habitat loss, forest degradation and fragmentation. Overhunting of prey species such as sambar deer also has an impact on tiger conservation efforts, as areas with less prey can support fewer tigers. If these threats to tiger conservation are not mitigated soon, we are very likely to experience localised extinction of the species in more and more forested areas in Malaysia over the next few years. WWF-Malaysia is dedicated to conserve tigers in the Belum-Temengor Forest Complex, together with government agencies and other stakeholders. Some of the key activities that WWF-Malaysia is involved in are on-the-ground protection of tigers from poaching, lobbying for better conservation and management of forests, scientific research on tiger population and prey base, ecological linkages for tiger and prey movement, stakeholder capacity-building, as well as engagement with the local Orang Asli communities to raise their awareness on tiger conservation issues. With the right conditions, Belum-Temengor and the larger landscape has the potential to harbour a viable population of tigers which can persist over the long-term. The 13 tiger range country governments have also made a commitment to double tiger populations by the next Year of the Tiger in 2022. The survival of sea turtles is critical as they help maintain the health of seagrass beds and coral reefs that benefit commercially-valuable species, such as reef fishes, shrimp, lobster, and tuna. Unfortunately, human ignorance has contributed to the loss of many turtles. This includes the consumption and trade of turtle eggs, direct capture of turtles for their meat and shell, fishery-related mortality (accidental death in the nets and long-lines of fishing fleets), poorly planned coastal development, marine and nesting beach pollution leading to loss of nesting and feeding habitats, unsustainable tourism, and climate change. Turtle protection laws in the country are not comprehensive or uniformed. Under the Federal Constitution, each respective state has the authority in making its own laws on turtles. State laws vary from each state and are inadequate in combating human practices of consuming turtle eggs. For over 40 years, WWF-Malaysia has been committed to conserve turtle populations through the phase out of licensed turtle egg collection, and is working towards a national ban on egg possession to protect eggs from poaching and consumption. Wildlife crime incidents related to marine turtles and their parts need to be eliminated through strengthening enforcement capacity and increasing efforts. Turtle monitoring and patrolling should be strengthened as a preventive measure to combat turtle crime. Through our outreach programme, WWF-Malaysia encourages the younger generations among local communities to protect their natural heritage of turtles. Turtle protection has come a long way from the set-up of the Ma'Daerah Turtle Sanctuary in Terengganu by Department of Fisheries and the establishment of Melaka and Terengganu turtle project sites in 2004. 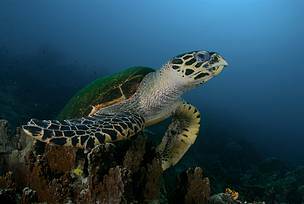 As of 2016, the nesting Green and Hawksbill turtles in Terengganu have reached around 10,000 nests; the highest record in the past 25 years. The orangutan, the largest of the great apes, and endemic to Borneo and Sumatra, plays an important role in maintaining the health of forest ecosystems. Feeding primarily on fruit, they help disperse seeds – a function played by a host of other animals as well. Due to their behaviour of pulling and bending together branches and leaves to build a nest to sleep in everyday, they allow light to reach the forest floor as a result – a very important requirement of plants growing in the undergrowth in the thick tropical rainforests. In 2016, IUCN downgraded Bornean orangutan's conservation status to Critically Endangered. This means that the species is facing an extremely high risk of extinction in the wild. The orangutan population in Sabah had dropped to about 11,000 individuals from 20,000 orangutans in 1980s. This steep decline in numbers in 20 years was caused by planned conversion of forests to plantations in the eastern lowlands. In 2009, WWF-Malaysia started work on restoring 2,099 hectares of degraded forest in Bukit Piton Forest Reserve, an important orangutan habitat in Sabah that had previously undergone unsustainable logging and forest fires. This was done by planting almost a million seedlings and conducting constant maintenance to ensure their survival. The tree-dependent apes have been observed using the planted trees within four to five years of planting – a positive sign of the recovery of the species in the area. Apart from the Bukit Piton Forest Reserve, two other forest reserves important to orangutan conservation have been gazetted as totally protected areas by the Sabah Forestry Department i.e. the Northern Gunung Rara in 2014 and Trusan Sugut in 2015. In Sarawak, orangutans can be found in Batang Ai, Ulu Sebuyau and Sebangan National Parks and Lanjak Entimau Wildlife Sanctuary with an estimated population of 2,000 individuals. WWF-Malaysia is working closely with partners to ensure that orangutan habitat in Sarawak is secured and well managed through effective and collaborative management within and adjacent to Totally Protected Areas. 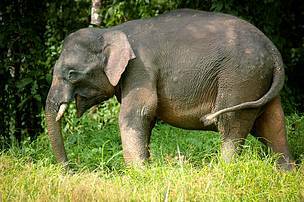 Borneo’s elephants, limited in range to the remaining forested areas in Sabah (but also minimally in north-east Kalimantan) are losing their habitat due to forests being converted to land uses such as monoculture plantations. As they come into more contact with agricultural lands and settlements build on their traditional routes, the risk of human-elephant conflict increases. In the Lower Kinabatangan Wildlife Sanctuary, for example, it is estimated that 20%of the 300 elephant population here had sustained gruesome injuries from snares set illegally in the forest to catch small game animals. With an overall population of approximately 1,500 of them left in the wild in Sabah, urgent and continuous actions need to be undertaken in order to conserve these gentle giants. WWF-Malaysia is dedicated to convince plantation companies that corridors or land set aside for elephants (to pass through from forest to forest) will benefit them in the long run when compared to losses due to palms being damaged by elephants. The organisation’s recommendations include wildlife or green corridors that link fragmented patches of forest as well as strategic placement of electric fences. WWF-Malaysia established the Human-Elephant Conflict Kalabakan Technical Group in 2016 as a means to bring stakeholders together to manage human-elephant conflicts. Due to its long-term engagement and advocacy, Sabah Softwoods Berhad voluntarily set aside land for elephants and other wildlife in 2013 (1000 ha) and in 2016 (80 ha), an example of good corporate governance and environmental responsibility. Nesting for the distinctive Hawksbill turtles has increased in Terengganu thanks to conservation efforts. 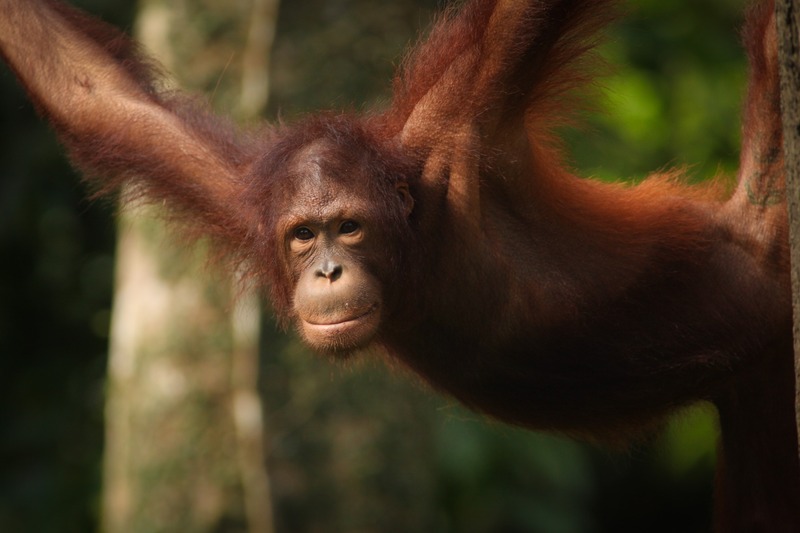 Orangutans are found nowhere else in the world except Borneo and Sumatra. The risk of human-elephant conflict increases as their settlements are disturbed.